Occasional, I'll end up getting a comic book I was unaware was part of a crossover. 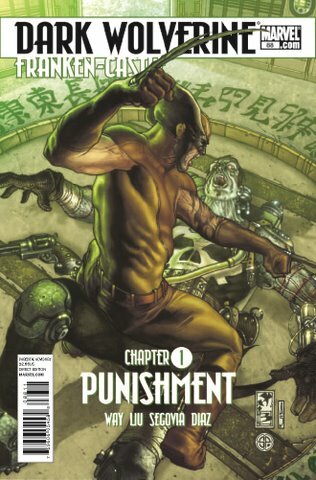 Last week I opened Franken-Castle #19 and discovered it was the second part to a 4 issue Daken (Dark Wolverine) and Punisher (Franken-Castle) crossover. When I went to the comic shop today and picked up Dark Wolverine #88, part 2 of the crossover, I was unsure of how I would take to the issue since I knew where it would end. Would it be like watching Dragon Balls Z and then going back and watching the original Dragon Ball, or would the comic of the day be more along the lines of watching the season premier of the Simpsons when Maggie shot Mr. Burns and then watching the season final from the previous season when one still didn't know who shot Mr. Burns (sorry for that spoiler if you were just getting to that episode on DVD...I mean it was so obvious when Mr. Burns pointed out the upside down cardinal points of West and South with his arms...M.S. - Maggie Simpson)? The comic of the day! Ah yes. As I was saying, Dark Wolverine #88 still reads just fine even though I knew where it would lead. In fact, I enjoyed some of the beginning battle action between Daken and the Punisher which was brutal, but not quite to the level of Franken-Castle #19's part 2. Here's hoping Dark Wolverine #89, part 3 of the crossover, will only increase the onslaught of violence and entertainment (Dom toasts by himself with a bottle of water and half peeled orange).